So today I said to my girlfriend ‘we have £40 for a Christmas tree, let’s go and see what we can get’. I’ve always loved Christmas, I always go big this time of year, for presents, food, clothes (gots to have my Christmas jumper), so when we say get any Christmas tree for £40, we wanted the biggest, fattest, floofiest tree we could find. Now the problem with this is we live in a two bedroom cottage, with an 8ft wide by 8ft tall room. 1) Have you got appropriate transport? When we bought our tree, not only did we get a monster, but we also had to carry it home, as our Nissan Micra is just too small. We’ve been together 8 years now, and every year we’ve made this mistake. Every year we carry this …kg (… pounds for the Americans) over a 45 minute walk. By the time we get home, covered in pine needle scratches and bruised muscles, the romance of Christmas is just gone, and the mere thought of looking at each other just because disgustingly infuriating. It’s not worth the agro, and if you’re considering the position of big bicep boyfriend, or Wonder Woman girlfriend, I implore you to stop. Christmas trees might not seem heavy at first (or they may depending on you strength), but give it five minutes and you’ll be stopping and starting, arguing with your partner and threatening to start a yule tide bonfire. Most people are normally sensible when transporting trees and they either get a tree that can fit in their vehicle, sort the help of a friend with a large enough car or van, or get the tree people to deliver it for you- the last option may cost a bit more, but might just save your relationship (if you have one). 2) Will the tree fit in your house? This may sound like a daft question, but it has been scientifically proven that people often over estimate how large their furnishings are in relation to their home; by the way, this fact is not true, it’s just that ‘scientifically proven’ sounds more professional. But if you’re anything like me and my Girlfriend, you’re definitely going to have convinced yourself that the tree from home alone would look tiny in your front room- this could not be further from the truth for us. When getting a Christmas tree, a tape measure can be your best friend. A simple measure of your living room for both height and width can give you a good idea of what kind of tree you can get. But don’t stop there, do remember to also measure the Christmas tree before purchasing to make sure that it fits your room. Otherwise, you could end up with a monstrosity that blocks your walk way, your TV and your life. 3) Do you have pets? So if you wanna avoid another Christmas tree disaster like mine, please follow the above steps. There may still be time to fix things with your loved ones, but for me, it’s too late. Our cats have never climbed the tree but they’ve been happy to undecorate it for us. Just as soon as we got the decorations on, they were swiping them. 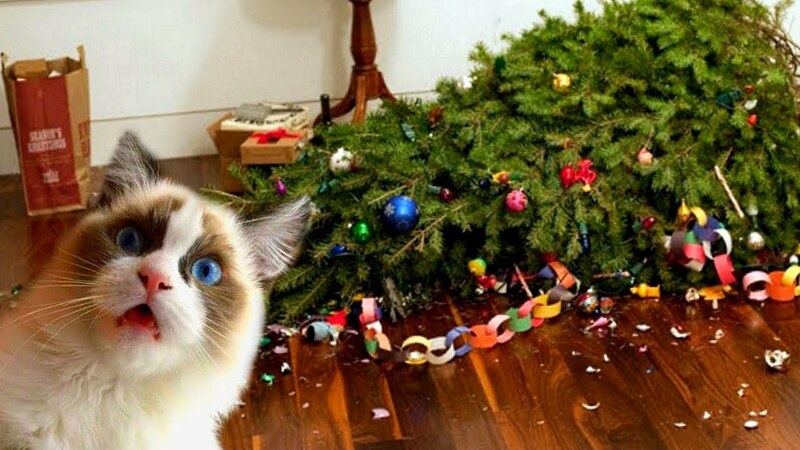 I know your pain, most of my baubles have ended up smashed on the floor, with just a pride cat stood grinning amongst them! We took to hanging the unbreakables on the lower branches and the breakables (theoretically) out of reach. We have had some very odd looking Christmas trees. But you know, if the cat’s happy…. Good idea, I will have to try this, even if the tree does look out of fashion! So fed up of picking sharp plastic out of my foot. One of our cats started cracking the lightbulbs between her teeth. The ornaments on the floor are a given. The Iguana was looking out from the top and we finally had to put the tree on our bedroom and close the door. I know someone who put their tree in a playpen. Kind of spoils the beauty of it but hey, ya gotta do whatcha gotta do. Yeah, cats really are an underestimated risk with tress, especially when they’re hard enough to break lightbulbs with their teeth, that’s just terrifying!